This was an amazing week for stocks. The S&P 500 increased 4.85%. That’s greater than the entire year to date increase which is 3.24%. Stocks rallied 0.82% on Friday because of hopes that America and China will make a trade deal. It’s dangerous for stocks to rally on trade war speculation. It increases the amount they will fall if there isn’t a deal. And it decreases the amount they will rally if there is a deal. Personally, I think if there is a deal in the next few weeks, stocks will rally and then fall again. A deal would be great, but it doesn’t change the direction of economic growth. Not having a negative catalyst doesn’t equal a positive. Even though stocks had an amazing week, the CNN Fear and Greed index ended the week at 22 which is extreme fear. I was wrong to doubt the index this week. However, stocks had 2 catalysts which helped them: the Fed and trade negotiations. I don’t think Powell was dovish, but stocks did. We will see who was right at the next meeting on December 19th. The best 2 sectors on Friday were utilities and healthcare as they increased 1.54% and 1.08%. It’s weird to see utilities leading the market on a positive day. They were probably up because the long bond rallied. I will discuss that in the next section of this article. The only down sector was energy as it fell 0.24%. Oil fell 22% in November, making it its weakest month in over 10 years. The stock market rallied, which would make you think investors are optimistic on economic growth. Yet the long bond also rallied which signals growth is slowing. Finally, after being completely wrong for a few weeks, my bullishness on the long bond has been proven correct. The 10 year yield fell 4 basis points on Friday to 2.99%. That is a very sharp decline of 27 basis points from its peak early in November. The decline in oil and weak economic reports justify this decline in yields. This decline in the long bond yield once again proves the argument that high deficits don’t cause yields to increase. The Fed letting its balance sheet unwind without purchasing new treasuries and mortgage backed securities also hasn’t pushed yields higher. Investors are falling in love with the 10 year bond because they know economic growth will slow in 2019. 2 year bond yield declined 2 basis points to 2.79% which means it is down 18 basis points from its cycle peak. 3 month treasury bill is at 2.34%. Fed rate hikes probably will affect the 3 month yield more than the 2 year yield. This hike cycle is close to ending. Even though the 2 year yield fell, there’s still an 82.7% chance the Fed hikes rates in December. The 2 year yield is falling because the chance of that being the last rate hike of the cycle is increasing. Assuming the Fed hikes in December, the futures market sees one hike in 2019 as the most likely option. There is a huge difference between what the market thinks will happen and what the Fed suggested in its September dot plot. The December dot plot will tell us if the Fed changes its guidance. If the Fed doesn’t move, it will invert the curve. 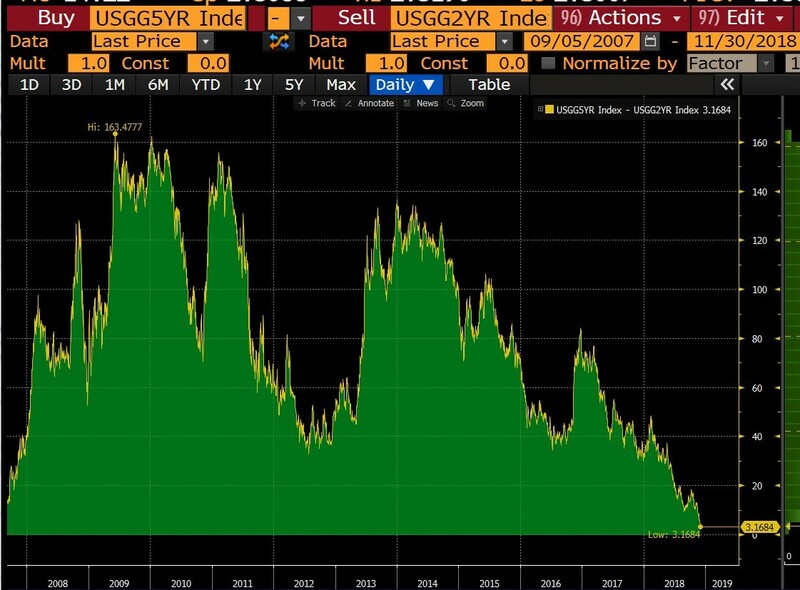 As you can see from the chart below, the difference between the 5 year yield and the 2 year yield has been shrinking quickly. The difference is now only 3 basis points. It should invert in December. The housing market is the earliest indicator that a recession is coming in the next few quarters. Housing stocks have peaked 9.6 months on average before the S&P 500 peaks in the past 5 cycles. ITB housing ETF peaked in January 2018. Housing stocks have rallied recently, but I think that’s a temporary blip. ITB is up 9.48% from its year low on October 24th. Housing stocks cratered sharply this year. That priced in a lot of the weakness we’ve seen in the last few reports. However, if the data continues to weaken, housing stocks will collapse further. October pending home sales were down 2.6% month over month which missed estimates for no decline. The September report was revised higher to show 0.7% growth instead of 0.5% growth. 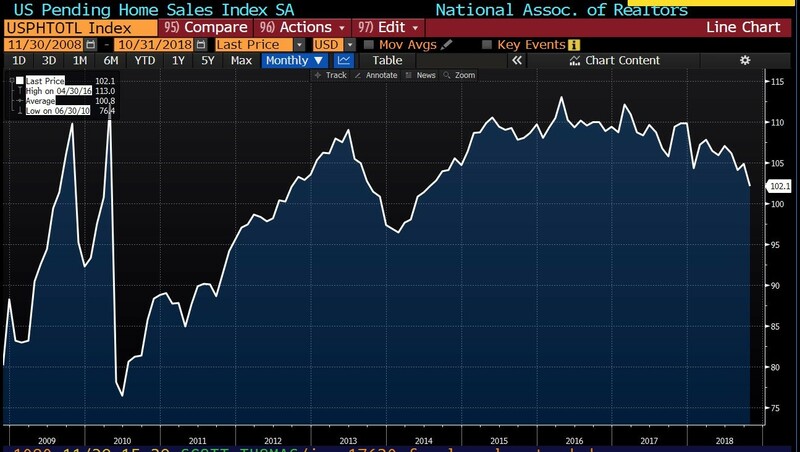 As you can see from the chart below, the pending home sales index fell from 104.8 to 102.1 which is the weakest reading since 2014. The decline from 2013 to 2014 preceded the economic weakness in late 2015 to early 2016. Yield Curve - How far this index falls will give us an idea of how bad the slowdown will be. Since housing was considered highly unaffordable in 2018, I don’t see how this index doesn’t crater below the early 2014 low. The strong labor market and low inflation haven’t been enough to strengthen the housing market. If jobless claims continue to spike, the labor market will quickly go from a tailwind to a headwind for the housing market. The west was the weakest region as pending home sales fell 8.9% year over year. Midwest and the south saw single digit declines. And the northeast had a marginal yearly gain. Overall, pending home sales fell 6.7% year over year. Sales weakness signals price declines or at least moderation in price growth are coming. Leading indicators of a slowdown are in place. Housing market is weakening and the ECRI index is negative year over year. The yield curve and jobless claims are close to signaling a red flag. This curve is 18 basis points away from inverting and claims are closing in on 250,000. The stock market rally this week could be an aberration. However, a trade deal is a potential positive catalyst for stocks. If stocks rally, that will be a great time to short the market given the cyclical weakness.